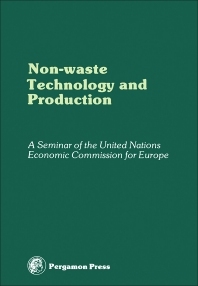 Non-Waste Technology and Production covers the proceedings of an international seminar organized by the Senior Advisers to ECE Governments on Environmental Problems on the Principles and Creation of Non-Waste Technology and Production, held in Paris on November 29 – December 4, 1976. The book focuses on the dynamics, applications, processes, and methodologies involved in non-waste technology, including recycling and measures adopted by countries on non-waste development. The selection first offers information on the concepts and principles of non-waste technology, as well as the social aspects of the problems of non-waste technology; and systems analysis as a basis for the creation of non-waste technology. The text also provides an introduction to recycling in CTS as a means of reducing waste and methods of processing waste into secondary material resources. The book then takes a look at concepts and principles of non-waste technology and the adoption of eco-activity as an approach to non-waste technology. The text surveys the application of non-waste development in different countries, such as Austria, Belgium, Federal Republic of Germany, Poland, the United States, Yugoslavia, and Sweden. The manuscript also underscores the applications of non-waste technology in the industrial settings and the methods of conserving raw material and energy and protecting the environment in chemical and electro-chemical plating plants. The book is a vital reference for readers and environmentalists interested in non-waste technology.